Samsung Guru E2152 Dual Sim (GSM+GSM) phone has been launched in India. The low-end phone comes with 2-inch 128×160 screen, VGA camera, stereo FM radio, MP3 player, Bluetooth, 1000mAh battery (up to 11 hours of talk time), fake call, dedicated music key, 7.5 MB of internal memory, and a microSD memory card slot. 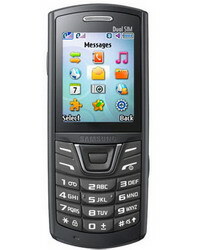 Samsung Guru E2152 phone is available with a price tag of Rs. 3,550 which is about $79 in India. 0 comments on "Samsung Guru E2152 Dual Sim (GSM+GSM) phone launched"